The Prayer for Haiti Charity Single – Anniversary | Marbella Marbella – Adelante! Wednesday 12th January marks the first anniversary of the devastating earthquake that struck Haiti, where at least a QUARTER of a MILLION people died. 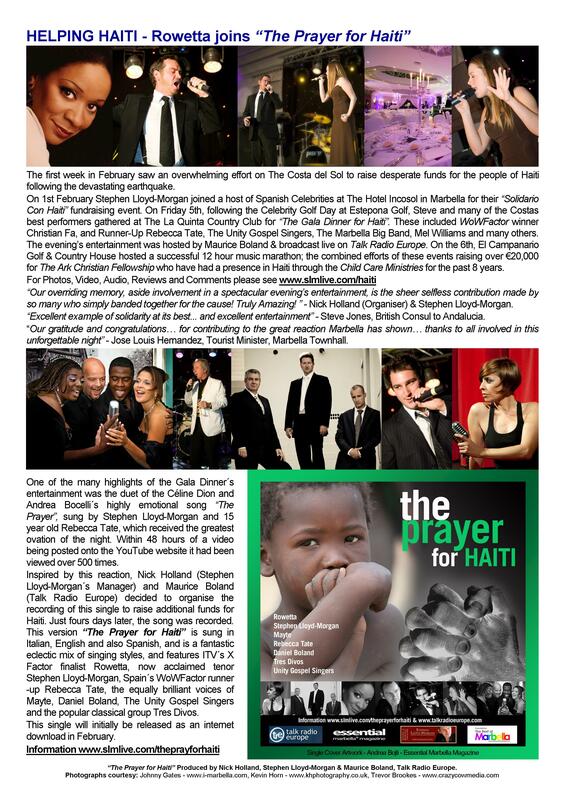 Part of our efforts here on the Costa del Sol was the charity record “The Prayer for Haiti”. The combined fundraising efforts here last year raised over €30,000 for the children of Haiti, and these funds went direct to them via the Ark Christian Fellowship and The International Child Care Ministries. The single is still available on itunes for just 79p. http://itunes.apple.com/gb/album/the-prayer-for-haiti-single/id357557587 We are still extremely proud of this record and thank again the amazing team who all helped to make it possible in such a short space of time. Information www.slmlive.com/theprayerforhaiti. In this anniversary week please help us to continue to help the children in Haiti! THANK YOU!